Oct. 24, 2016 – Globally averaged concentration of carbon dioxide in the atmosphere reached the symbolic and significant milestone of 400 parts per million for the first time in 2015 and surged again to new records in 2016 on the back of the very powerful El Niño event, according to the World Meteorological Organization’s annual Greenhouse Gas Bulletin. Between 1990 and 2015 there was a 37% increase in radiative forcing – the warming effect on our climate – because of long-lived greenhouse gases such as carbon dioxide, methane and nitrous oxide (N2O) from industrial, agricultural and domestic activities. “The recent agreement in Kigali to amend the so-called Montreal Protocol and phase out hydrofluorocarbons, which act as strong greenhouse gases, is good news. 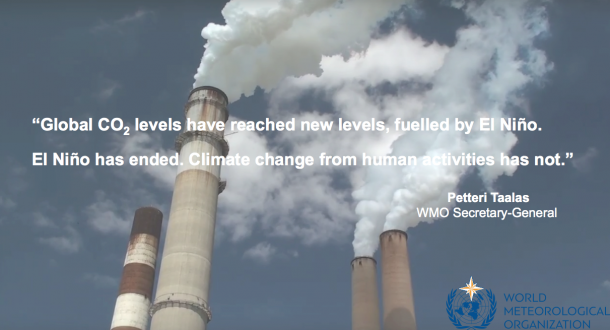 WMO salutes the commitment of the international community to meaningful climate action,” said Mr Taalas. “But the real elephant in the room is carbon dioxide, which remains in the atmosphere for thousands of years and in the oceans for even longer. Without tackling CO2 emissions, we can not tackle climate change and keep temperature increases to below 2°C above the pre-industrial era. It is therefore of the utmost importance that the Paris Agreement does indeed enter into force well ahead of schedule on 4 November and that we fast-track its implementation.” he said. WMO and partners are working towards an Integrated Global Greenhouse Gas Information System to provide information that can help nations to track the progress toward implementation of their national emission pledges, improve national emission reporting and inform additional mitigation actions. This system builds on the long-term experience of WMO in greenhouse gas observations and atmospheric modelling. WMO is also striving to improve weather and climate services for the renewable energy sector and to support the Green Economy and sustainable development. To optimize the use of solar, wind and hydropower production, new types of weather services are needed. 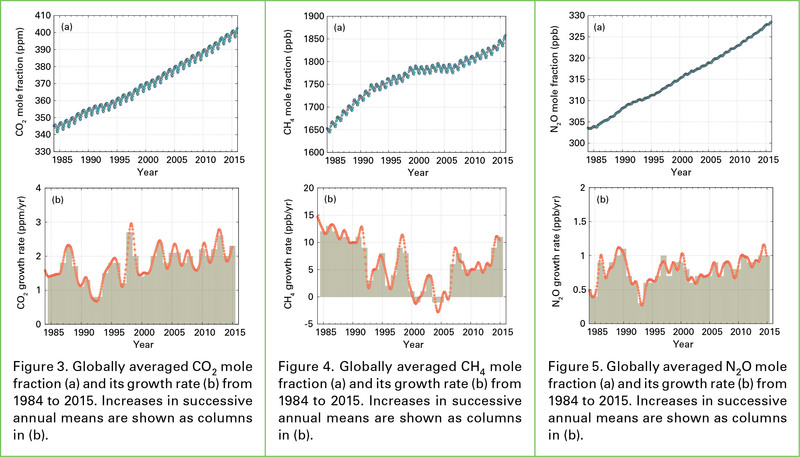 The WMO Greenhouse Gas Bulletin reports on atmospheric concentrations of greenhouse gases. Emissions represent what goes into the atmosphere. Concentrations represent what remains in the atmosphere after the complex system of interactions between the atmosphere, biosphere, cryosphere and the oceans. About a quarter of the total emissions is taken up by the oceans and another quarter by the biosphere, reducing in this way the amount of CO2 in the atmosphere. The Greenhouse Gas Bulletin provides a scientific base for decision-making. WMO released it ahead of the U.N. climate change negotiations in Marrakech, Morocco, to be held from 7 – 18 November 2016. Carbon dioxide (CO2) accounted for about 65% of radiative forcing by long-lived greenhouse gases. The pre-industrial level of about 278 ppm represented a balance between the atmosphere, the oceans and the biosphere. Human activities such as the burning of fossil fuels has altered the natural balance and in 2015, globally averaged levels were 144% of pre-industrial levels. In 2015, global annual average concentration of CO2 concentrations reached 400.0 ppm. 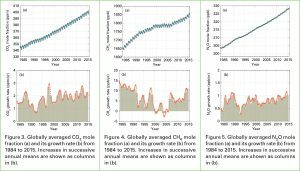 The increase of CO2 from 2014 to 2015 was larger than the previous year and the average over the previous 10 years. In addition to reducing the capacity of vegetation to absorb CO2 the powerful El Niño also led to an increase in CO2 emissions from forest fires. According to the Global Fire Emission Database, CO2 emissions in Equatorial Asia – where there were serious forest fires in Indonesia in August-September 2015 – were more than twice as high as the 1997-2015 average. Methane (CH4) is the second most important long-lived greenhouse gas and contributes to about 17% of radiative forcing. Approximately 40% of methane is emitted into the atmosphere by natural sources (e.g., wetlands and termites), and about 60% comes from human activities like cattle breeding, rice agriculture, fossil fuel exploitation, landfills and biomass burning. Atmospheric methane reached a new high of about 1845 parts per billion (ppb) in 2015 and is now 256% of the pre-industrial level. Nitrous oxide (N2O) is emitted into the atmosphere from both natural (about 60%) and anthropogenic sources (approximately 40%), including oceans, soil, biomass burning, fertilizer use, and various industrial processes. Its atmospheric concentration in 2015 was about 328 parts per billion. This is 121% of pre-industrial levels. It also plays an important role in the destruction of the stratospheric ozone layer which protects us from the harmful ultraviolet rays of the sun. It accounts for about 6% of radiative forcing by long-lived greenhouse gases. The first of annual WMO Greenhouse Gas Bulletins. It describes the state of the global atmosphere with respect to its contents of long-lived greenhouse gases. Sulphur hexafluoride is a potent long-lived greenhouse gas. It is produced by the chemical industry, mainly as an electrical insulator in power distribution equipment. Atmospheric levels are about twice the level observed in the mid-1990s. Ozone-depleting chlorofluorocarbons (CFCs), together with minor halogenated gases, contribute about 12% to radiative forcing by long-lived greenhouse gases. While CFCs and most halons are decreasing, some hydrochlorofluorocarbons (HCFCs) and hydrofluorocarbons (HFCs), which are also potent greenhouse gases, are increasing at relatively rapid rates, although they are still low in abundance. WMO has produced three new animations to support the launch of the WMO Greenhouse Gas Bulletin 2015 and to promote a new concept for monitoring greenhouse gas emissions, sources and sinks. The animation on “The carbon cycle” provides basic background about rising atmospheric levels of greenhouse gases. “Measuring national emissions” and “Monitoring the atmosphere to reduce urban greenhouse gas emissions” describe how high-resolution monitoring of the atmosphere can now be used to more accurately measure GHG emissions in order to support decision-making. The animations are available in Arabic, Chinese, English, French, Russian and Spanish.